One of the greatest and most unexpected joys of writing this blog has been acquiring a number of, ahem, more senior readers – those who may have grown-up kids and/or grandkids. If this is you, please know that I am soooo blessed by your presence here, your words of encouragement and the fact you spend some of your precious hours reading my words. I’m sure my naivety in this whole parenting business is regularly exposed – and yet you choose to forget the words I speak in ignorance, and instead encourage me to persevere in writing and parenting. Thank you. OK, so hopefully I’m a bit more nuanced than that. But I also recognise that many of you were once optimistic young parents just like me, who faithfully discipled and prayed for their kids. You bought the books, you led the devotions, you attended church together, you answered question after question after question, sometimes talking about life and faith late into the night. And then your kids grew up – and now one or more of them are no longer following the faith you so longed for them to make their own. And you try to remember grace, and unconditional love, and the fact we all have to make these decisions for ourselves – but still you have moments of great guilt, and shame, and “Where did we go wrong?” Your friends’ children are all vicars and missionaries, and you read their Christmas newsletters with an envy you would never admit. At your lowest point, you feel like you’ve somehow let God down with the children He gave you. If this is you, I have some thoughts for you. Your child is God’s, first and foremost. He graciously gifted her to you, to love and care for and nurture. These things were your responsibility. Ensuring her salvation wasn’t. If you feel guilty because she hasn’t pursued a relationship with Christ, you’re feeling guilty over something which wasn’t your job in the first place. 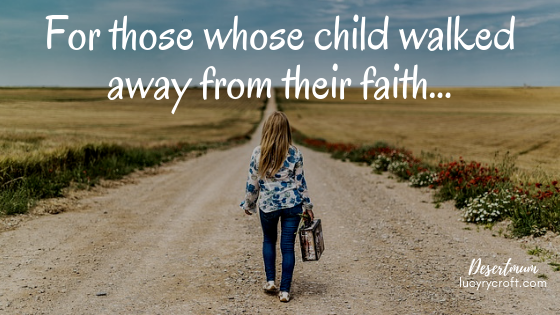 Sure, the Bible tells us to train our children “in the way they should go” (Proverbs 22:6) – but when it comes to a decision, the emphasis is always on the individual (John 3:16, and so many other places). It’s okay to feel grief. But not guilt. Guilt is not okay. But I think grief is. It’s understandable that, if you have a relationship with Jesus and understand your faith to be the source of guaranteed eternal life, you will grieve over your child not having this hope for himself, not to mention the fulfilment and peace you wish he had in this life. I think it’s important to try and separate these two emotions. Grief can easily morph into guilt. When it does, that needs to be taken to God, as ‘there is no condemnation in Christ Jesus’. In other words: guilt (or ‘condemnation’) is from Satan. He’s trying to knock you off balance, trying to tempt you to trust in your own good works in order to be saved, trying to convince you that your ‘bad works’ have made God displeased with you. You know that’s not true! If you’re truly going to live in the freedom that Jesus won for you, you need to get rid of this obstacle of guilt. Find a trusted friend – ask them to pray with you. Ask God to deal with all the unnecessary emotions you are feeling. You can’t make your child’s decision for him – but you can make a decision to follow Christ yourself, unashamed, wholeheartedly, not held back by a situation outside your control. We like to be in control – but you cannot control your child’s experiences. You may have done all the ‘right’ things – the teaching, the discipling, the prayer, the church involvement – but any person, as they grow up and hit early adulthood, will have a variety of things happen to them which are no one’s fault, but which can shake faith. I write a lot about adoption, which means I spend a great deal of time contemplating early childhood trauma, and its effect on child development and adult mental health. Yep, I’m a fun date. But, in my thinking and writing and research, I’ve come to realise just how many seemingly innocuous things can affect a child. We simply cannot protect them from everything. A house or school move can rock the boat. A new teacher. A particular group of friends. Don’t beat yourself up about situations outside your control, both positive and negative, which may have adversely affected your child’s faith: peer pressure, bullying, illness, bereavement, education, career progression. We are all the product of our experiences – and, to some extent, the faith that we have is also shaped by these experiences. The gospel doesn’t change, but how we respond to it does. In some ways I’d like to pat you on the back and say, “Don’t worry, you did the best you could”. But we all know that’s simply not right. I don’t always do the best I can as a parent – and neither did you. Sorry, but it’s the truth! We mess up as parents every day – we’re too lax or we’re too strict, too controlling or too easily controlled. I don’t always respond to my children in a Christlike, loving way. Too often, I respond because my idols have been messed about with, and I don’t like it. I’m doing ‘what I can’ to introduce my children to the God I love and trust – but I’m doing this while simultaneously screwing up their lives with my own issues, triggers and worst personality traits. I haven’t the faintest idea whether they’re going to end up following Christ or not. So, yep, we’re not perfect. But, fortunately, God is used to imperfect humans. Being perfect ain’t a requisite for having God-honouring children. (If you don’t believe me, think of Saul and Jonathan.) And if your kids have chosen not to put God first, then don’t feel it is because of your imperfections. It is not. The choice was always going to be theirs, not yours. Some of you might be reading this and thinking “But I didn’t do any of those things. I was a young Christian when I was raising my kids, and I didn’t understand how to disciple them. I didn’t see the importance of it. I didn’t pray with them, or buy them books, or teach them the Bible”. Do you know what this is? This is an incredible story of how God has been working in your life! PRAISE GOD for how He has brought you closer to Him over the years! WOW! I love to see people come to faith – but, even more, I love to see people mature in faith. It’s so exciting! Don’t bemoan what you did or didn’t do for your children. You were in a very different place – and praise God that He has shown His grace and patience with you, and brought you into maturity. I know several people who weren’t Christians, or weren’t mature Christians, when their kids were young. Do you know what? Some of their kids are strong believers now, in adulthood – despite not really having had a strong Christian parental influence as a child. God can do this stuff – not you, not me – He really can! I don’t know why our prayers for our children are not always answered positively. I don’t know why many ‘good’ prayers aren’t answered in the way we would like. But I know this: God invented miracles. He’s pretty good at them. Never give up praying for your child. You may not live to see the impact your prayers have, but you can be sure that when you pray, something good is going on in heaven – something we can’t understand any more than we can understand why good prayers don’t get answered. We will never know how God is weaving together His master plan, bringing together all who love Him. It may not look like how we imagine. It may not look like church attendance, or giving a public declaration of faith, or having a Christian job. We can only pray, and trust that God will be just and faithful, and that the word sown in our children’s lives “will not return…empty but will accomplish what [God desires] and achieve the purpose for which [He] sent it” (Isaiah 55:11). If you know someone who needs to hear this message, why not send them this link? Great to read this.My children are young adults an see the world through the perspective of attachment issues,autism and learning disabilities. They have experienced church and faith through this perspective too! It occurs to me that I came to faith without any faith background at home so I know and trust that God can reach them too- I spite of my best efforts! It’s a good point about grief not guilt! Really helpful stuff Lucy. I have no idea what will happen with my lot, with one on the fence (in an incredibly thought through and well articulated process), one adamant they don’t believe in the God that they’re pretty angry at for all the bad stuff that happens, one who’s desperately clinging on and two who innocently believe in the way small people have the amazing ability to do. One thing you didn’t cover (which would probably take a whole new blog) is the judgement of ourselves and others. What will people think of me if my kids don’t come to church/don’t believe? I’ve challenged myself over the years for my lack of respect for church leaders who’s kids have drifted from the faith or alternatively, idolised the parenting of those who’s kids are still Christian and well involved with church life. All I can do is keep praying for my kids and ask God and my kids to forgive me when I get it wrong. Kate, I think you have a good point there re what will others think or idolising those who have grown up kids walking with God still. I have had the same thoughts myself. Its a challenge not to think we are doing something wrong. Pingback: Parenting Children for a Life of Faith – review and GIVEAWAY!